​DALLAS-FORT WORTH – With a building boom underway, business has continued to gobble up new North Texas office space this year. ​​While the leasing total was down slightly from first quarter 2016, it was enough to keep overall office vacancy in the area at just over 16 percent at the end of March 2017. Almost 5.9 million sf of office space was under construction in North Texas in Q1 2017, with much of that new building space opening its doors the same year. Average office rents for first-class buildings now top $30 per sf—the highest ever in Dallas-Fort Worth. First class office rents are even higher in Uptown—at more than $40 per sf on average—and in Preston Center in North Dallas, $37.76 per sf. 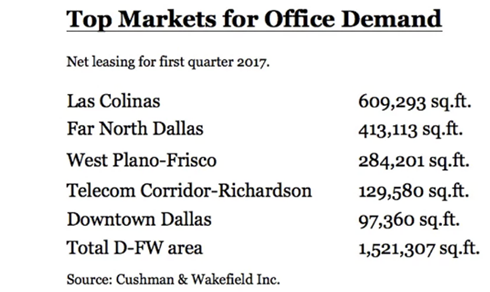 With almost 100,000 sf of net leasing in 1Q, downtown Dallas had one of the best office market showings in more than a year.